really does matter and I hope that every other speaker fells the same. 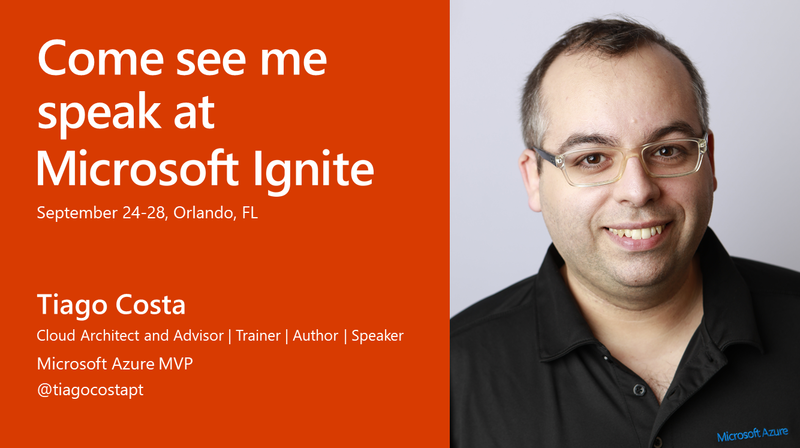 Speaking in all those conferences gave me the possibility to deliver 3 sessions in this year Microsoft Ignite. Has you can imagine I was thrilled and astonishing when I got the confirmation email. Microsoft Ignite is the high point of the conference season. I just finished all presentations and demos and I’m already in Orlando, so it’s GO time!!! A lot of new services and new features will be announced during the week, keep your eyes on social network and this blog. I will do my best to report everything ASAP. I have my gimble with me for some short videos that I plan to record with some of the speakers, PMs and general attendees. I want to bring the felling of Ignite to some of you that for all sort of reasons can’t attend in-person. During this 45-minute session, I will explain with real case scenarios how you can capacity your team for the brand-new world of the Cloud! Using cloud technologies is not something of the future, is the PRESENT, and if your team currently is not up to speed with Microsoft Azure, this is a to-go session. We will go throw all the steps needed to get your team able to design, Architect, develop and maintain Microsoft Azure based solutions. A lot of resources will be shared in this session. In this session I will have the honor to officially release the new Microsoft Azure Certifications from Microsoft Learning. A lot will change and if some is already public because a part of it was launch in July during Microsoft Inspire, now we will open the full book! Everything will be shared. If you are in the Learning space and if your work with Microsoft Azure and want to be certified don’t forget to come by this session and get all the information first hand! In this short session, I will show how the Microsoft Graph can help developer build and integrate a file experience to store files into OneDrive and/or SharePoint in their apps.